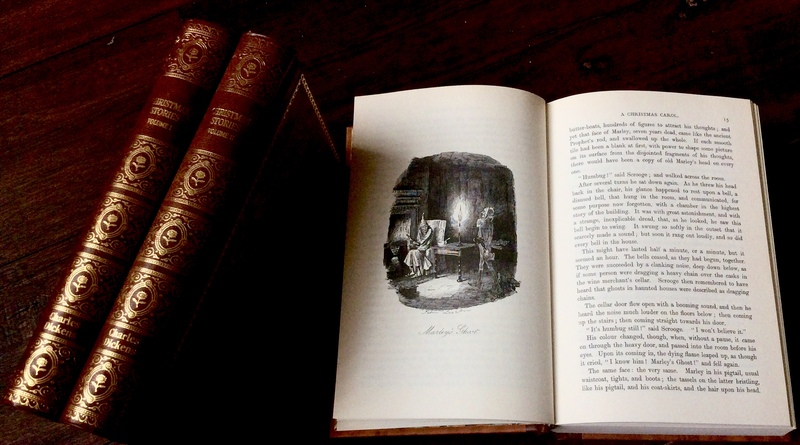 Yesterday I retrieved my copy of the Christmas books of Charles Dickens, the five of them in a single volume, from the bookshelf where they usually reside with his complete works (the only books on view in our living room). It is a facsimile of the 1876 edition. It was a day late as I usually begin ‘A Christmas Carol‘ on St Nicholas’s Day. I always finish ‘A Christmas Carol‘ but I have been known to finish all five books by Christmas Day but that was probably before I began blogging. Even further back I might have started on the other ‘Christmas stories’, 15 of them, in two volumes on my bookshelf, but I don’t think I ever finished them by 25th December. Christmas simply would not be Christmas for me without ‘A Christmas Carol‘. Dickens has been anyway one of my favourite authors since a very early age, perhaps even the favourite (though Emily Brontë is a strong contender). I am constantly astounded by his power of description, particularly of his characters, and I have him to thank first for my extensive vocabulary. I wish I could say the same about my powers of description in my stories. “The narrow space within which it was necessary to confine these Christmas Stories, when they were originally published, rendered their construction a matter of some difficulty, and almost necessitated what is peculiar in their machinery. How could I not continue to read after that (“to begin with” is a masterstroke), even if I know very well what follows? As you know, I also read this book every year. The words by Dickens are exquisite. Christmas wouldn’t be Christmas without it? Well, it would obviously. But it’s the holly on top of the pudding. I don’t start on the day you usually start. Just when it feels right to pick it up. I have an old 50p charity shop bought book I read. Have lots more expensive different versions too. But always read the little 50p Thomas Nelson and Sons edition containing 5 stories. No illustrations/pictures. But…..I too have books with the full Christmas works. May get around to them when I retire.